Parents Involved in Education (PIE) is a coalition of member organizations commited to close the education gap by empowering parents to be the best adovocates for their student’s academic success within the Saint Vrain Valley School District. The school year program offers 100% Bilingual presentation of local resources, plus direct communication with the leaders who offer the resources. In the 10+ years that this program has operated, hundres of parents have been empowered to be the change-makers in their local community. Philanthropiece is proud to be the newst PIE Taskforce member, now supporting the leadership of this growing program. We support building community through uplifting change-makers and celebrating the success of their cause. We recognize celebration as a form of resistance, in that finding time to laugh, share, and play can honor our shared humanity. 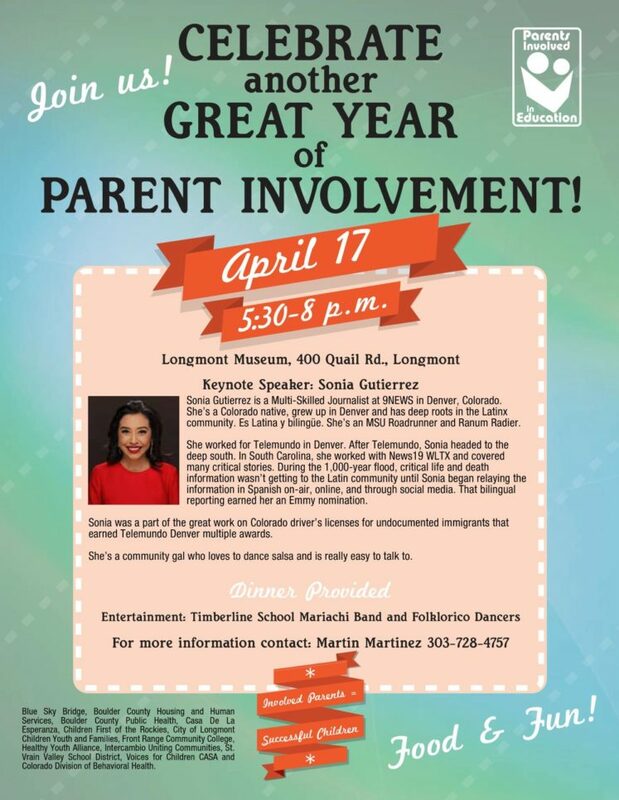 PIE works at growing parent education, involvement and empowerment throughout the entire school year, together with various other important local member organizations we are impacting many families in our Longmont and surrounding communities. The time has come to celebrate the culmination of our hard work in 2018-2019! A great year of building community together! Please join us for a night of culture, inspiration and unity!